End of the Great Allegheny Passage, beginning of the C&O Towpath. Bike shop about 10 yards away, shops, and a cool old building being converted into luxury lofts. Bikes mean business. Eric: One good thing about all this rain–it will wash the muck off the bikes. Me: That’s a very Sally Sunshine comment for you. Me: This is like swimming on bikes! Rider sheltering in a tunnel: Great day, isn’t it? Him: Nice way of putting it. Him: Oh, that explains it. 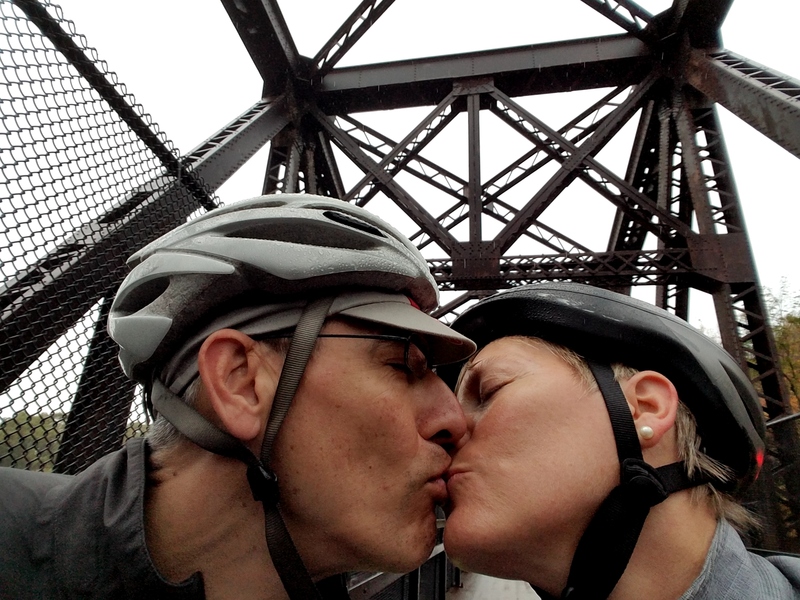 Liquid sunshine — and plenty of it — pretty much sums up today’s ride. We rolled out around 10:30 or 10:45 a.m. after doing a load of laundry and having that crucial second cup of coffee. Veggie mister rain quickly accelerated to a heavier rain, aided by a chilly little crossing headwind. Temperatures were lower than the last four days and the wind chill didn’t help. It’s too bad we hit such a gray and foggy day, as we crossed the Eastern Continental Divide and would have loved to get the view from there. 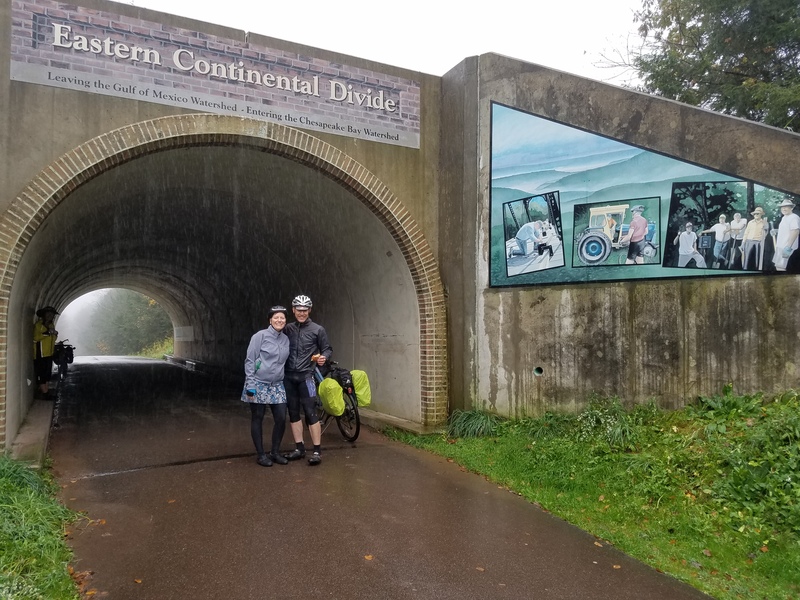 Tom and Kathy, a couple sheltering in that tunnel as we did to chow down a bit, have ridden the GAP before and told us it’s a wonderful view. Yes, the Mason-Dixon Line is a line. On the ground and everything. And from there it’s all downhill to Cumberland–yay! We picked up the pace. Tom and Kathy had mentioned a good place for hot soup and hot coffee in Frostburg. 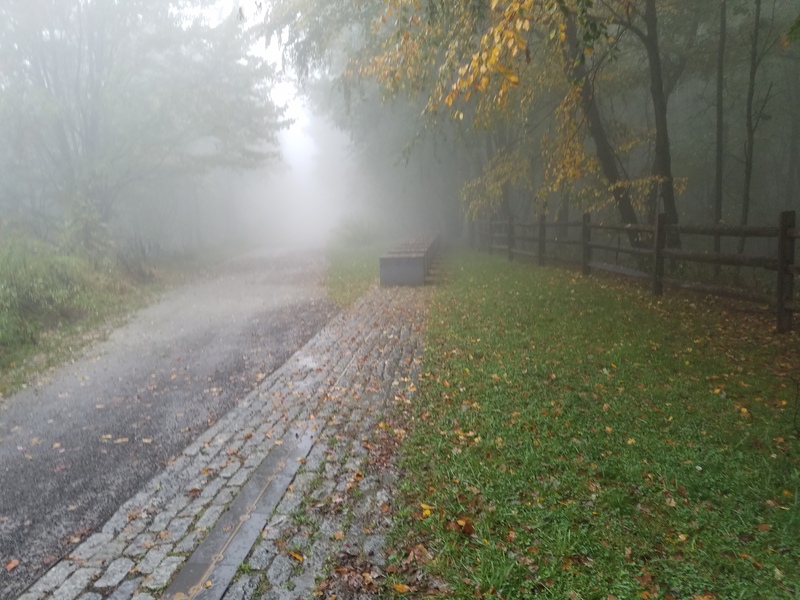 Much to my own amazement, however, when we got to the decision point for either riding uphill to coffee or continuing 16 miles in rain to Cumberland, I said I was 50/50 and happy to just gut it out and get to our end point. Apparently a hot bath and the end of the pedaling outdraws a hot cup of coffee that has to be followed by more wet riding. Eric entering the Big Savage Tunnel. It’s so long those lights on the ceiling are necessary but it’s still not fully lit and we kept our headlights on. Another shorter tunnel that has no lighting was pretty trippy. 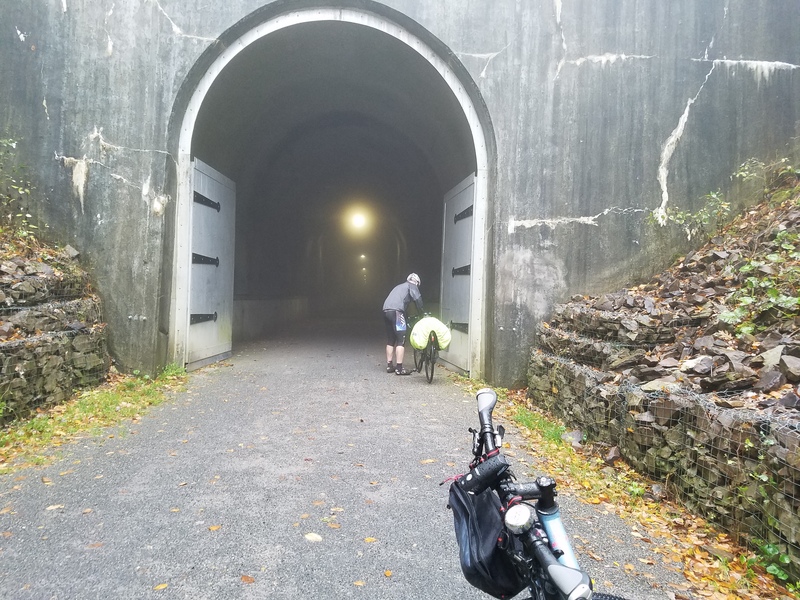 Today’s section included some really stunning tunnels, especially the Big Savage Tunnel, at nearly 1100 yards the longest tunnel on the trail. 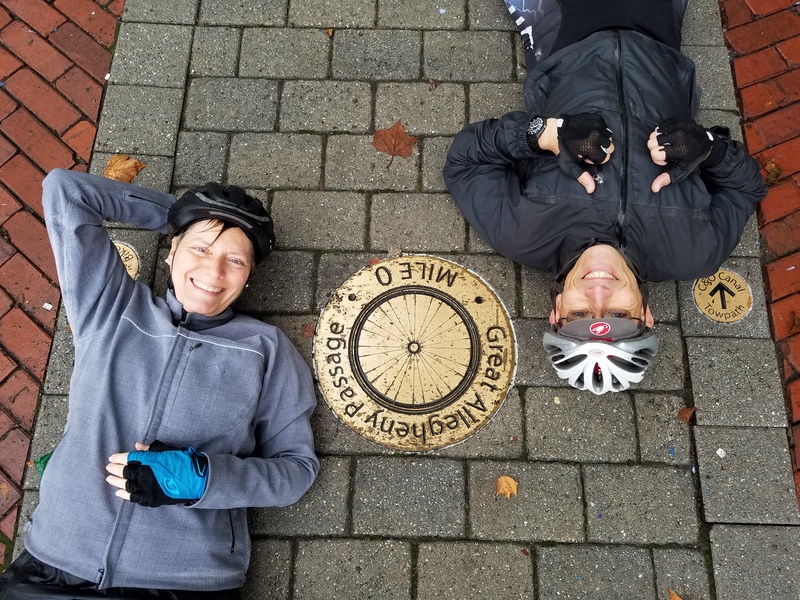 We crossed the Mason-Dixon line in the fog and reached the Mile 0 marker, where another rider obligingly took our goofy picture.